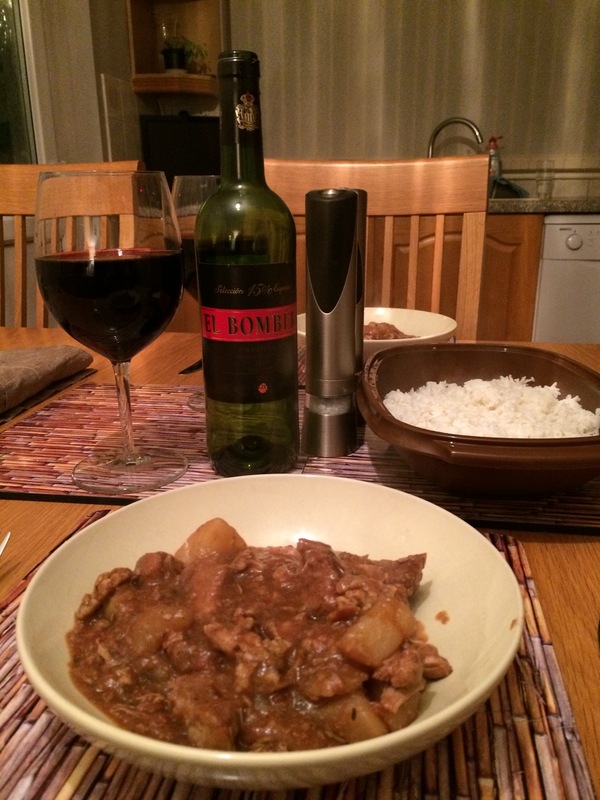 We revisited a recipe that we hadn’t cooked for a very long time, Apple and Pork Casserole from Supercook. Cubed pork is casseroled with onions, sage, seasoning, and apples. The mixture is topped with potatoes. We served with puréed carrots and swedes. We paired this simple casserole with a bottle of The Huguenot Chenin Blanc 2014, an off-dry South African white from Sunday Times Wine Club. There was a slight sweetness with apples, pineapples and tropical fruit flavours. 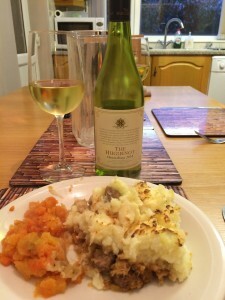 The wine was a very good match with the meal. We cooked Pork and Walnut Casserole, a Supercook recipe we had not done for ages. Cubed pork fillet is casseroled with onions, garlic, green chillies, potatoes, coriander leaves, canned tomatoes, salt, pepper, sugar, thyme and chicken stock. Halved walnuts are added towards the end. We served with boiled rice. Our tastes have changed a bit since we last cooked this recipe, because we found it a little bland compared with some of the fully-flavoured meals we have enjoyed in recent times. The wine was smooth and rich with spicy black cherry fruits and a good match with the meal.